Please refer to our stock # MOR6889 when inquiring. 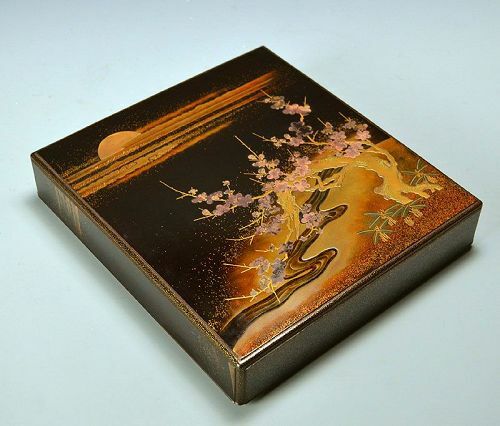 The full moon glowing in shimmering gold illuminates the silver blossoms adorning the ragged plum tree growing along the river bank, a superb lacquer box dating from the 19th century enclosed in a period wooden box titled Plum & Moon Maki-e Suzuri Bako. Inside the lid the stream continues, running past golden rocks and young flora reaching for the moon. Contained within is a grinding stone with gilded edges and a blossom shaped suiteki water-dropper inset into a raft structure upon which the brushes could rest without touching the brilliant sparkling nashiji gold flake. It is in overall very fine condition, measuring 23 x 25 x 5 cm (10 x 9 x 2 inches) with no cracks or repairs.